Clear View defrosters match the look and performance of factory installed defrosters, melting snow and ice in minutes for safe winter driving. Available as complete defrosters ideal for new installations or as Stick Kits for defroster replacement. Answers to the most frequently asked Clear View defroster questions as tracked by our Customer Service staff. How do Clear View Defrosters work? Just like factory defrosters, Clear View defrosters have an electrical resistance which when powered provides the heat needed to clear snow and ice. The heating is accomplished through contact between the defroster elements and the window. The defroster is connected electrically through the Clear View buss bar tabs to the vehicles power and ground and activated with the automatic ThermaSync defroster control. See the Clear View Defroster Guide for more. What size Clear View Kit fits my vehicle? My car does not have a defroster, what now? 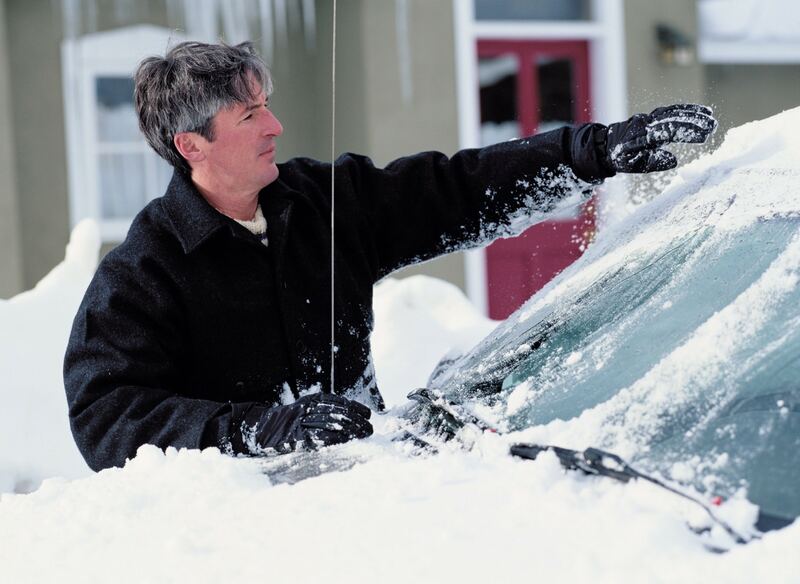 Can I replace a damaged defroster with a Clear View Defroster? No wire harness, control or installation pack are included. Stick Defrosters are ideal for defroster replacement in which the Clear View defroster can be connected to existing defroster wiring. See our Technical Bulletins for how to match up a replacement defroster in an existing defroster. How do Clear View defrosters fit the window? 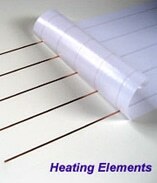 The Clear View self-adhesive heating elements come sandwiched between two pieces of release material. The elements are pre-spaced for easy and accurate application to the window. The elements are trimmed to size between the minimum and maximum lengths during installation for a custom fit. My window is larger at the bottom, problem? Clear View defrosters can be applied to windows that are typically larger on the bottom. The side buss bars can be angled to accommodate the glass shape. It is a good idea to keep this difference between the top and bottom width as small as possible since the electrical resistance will be more the longer the grids which will effect the temperatures of the longer grids which will be slightly lower. How do the Clear View Defroster part numbers work? Clear View part numbers are a little confusing but there is some logic behind the number series. The first two digits show the voltage, the second two numbers indicated the number of heating elements. In this example we have a 12 volt defroster with four heating elements. The next four digits are the minimum allowable installation length and the maximum. So the shortest this defroster can be installed is 23 inches and the longest is 31 inches. The L means the position of the power and ground tabs. in this case both tabs are on the same side (left) of the defroster. If there is no L then the tabs are on the left and right of the defroster. See the defroster order page! My car already has a defroster/switch. Can I get just the heating grid? Yes! Stick Kit Defrosters are available in most cases and include only the defroster. No wire harness, control or installation pack are included. Stick Defrosters are ideal for defroster replacement in which the Clear View defroster can be connected to existing defroster wiring. What sticks to the glass after the Clear View Kit is installed? Only the heating elements and the side bus bars adhere to the glass after installation. The Clear View elements bond directly to the glass using high performance structural bonding materials also used in aerospace. 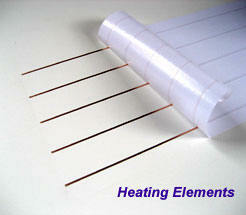 The heating elements match the color of factory defrosters. There is no plastic backing left on the window to crack or yellow. Can I connect a Clear View defroster to the original wiring already in the vehicle? The STK means Stick Kit which is the defroster only option and does not include any wire harness or control. Stick Kits are ideal for defroster replacement. Can I remove the the old defroster? Do I need to? If your putting a Clear View kit into a vehicle that had a defroster the rear window will have the original grids on the glass. Installing the Clear View kit requires that the glass be CLEAN so it is a good idea to remove the old grids. The vertical side bars can stay in place. The old grid will come off with a razor blade but there will be a brownish red tint in the area of the lines and that’s in the glass so it is not going anyplace. The Clear View vertical side buss bars can mount over the black screen material at the window edges. See our Technical Bulletin page for more on matching Clear View defrosters with existing defrosters. Do the defrosters come with instructions? Yes. Each Clear View defroster comes with fully illustrated step-by-step general instructions plus an attachment for the exact defroster being installed. What comes with Clear View Defrosters? Are they ready to install? Will Clear View defrosters work on windows that slide inside the tailgate? Sorry but no. The sliding motion and associated seals will not allow the defroster to work properly in this application. What is the grid layout? How big? What spacing? Clear View electrical and amperage? Clear View Defrosters are now available in hundreds of sizes in 12 and 24 volt each with its own amperage draw. The range is from 5 to 20 amps depending on design. The Clear View catalogs list the amperage for each defroster at their minimum and maximum lengths. Can I replace only a couple of lines in my defroster using the Clear View Kit? No. You cannot just string the heating element material across the old grid lines, connect them to the existing defroster side bars. Clear View element material is much more conductive than the original so its would essentially be a dead short with high temperatures and blown fuses. What about the defroster relay? Does the control have automatic shut off? All four ThermaSync models feature a remote mountable defroster switch with red indicator light and automatic shut off timing. Pressing the defroster symbol turns the control on and activates the LED indicator lamp. The control automatically shuts off at its designated time or when the switch is pressed again. Pressing the defroster symbol turns the control on and activates the LED indicator lamp. The control automatically shuts off at its designated time or when the switch is pressed again. Tint sticks to both the glass and the defroster and if removed can pull off the conductive elements on the defroster damaging the defroster sometimes irreparably. See our Defroster Fix It Troubleshooting Guide. Can Clear View defrosters be applied OVER window tint? No, sorry. The Clear View defroster elements must bond directly to the glass to and the tint film interferes with window heating and does not provide a good bonding surface. If the tint is part of the glass, as is commonly done with factory glass, then there is no problem with applying Clear View defrosters. Can I tint over Clear View defrosters? The Clear View heating elements are slightly higher off the glass than factory defrosters but many customers have applied tint over Clear View defrosters. The defrosters side buss bars are 1/4 inch above the glass when installed but the tint can be trimmed to fit these. Many of our customers have asked about changing the configuration or layout of the Clear View defrosters. While knowledgeable customers with a background in 12 volt systems have done amazing things with our grid systems Clear View defrosters MUST be installed as per the instructions. Do NOT remove grid elements or change the layout of the side buss bars. How do I make the power connection in the Vehicle? Each Clear View kit comes with complete wiring harness including connectors and a “T-Tap” that can be used to easily make the power connection. 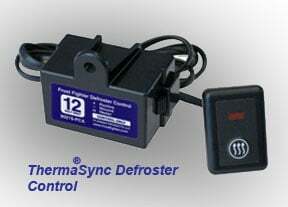 The ThermaSync Defroster Control has three connections, Power, Ground and one for the defroster. Can I clean my back window after installing a Clear View Kit? Yes! We suggest that you use a little more care than just spraying cleaner and rubbing with a towel although. The technique is to spray the glass cleaner onto the cloth then rub the glass from side to side ALONG the grids not up and down ACROSS the grids. My vehicle has tightly curving glass at the edges. Can I still install a Clear View kit? The defroster elements can be installed on curved glass or more specifically glass that curves in a single direction. The defroster elements come sandwiched between two pieces of release paper. The paper is very flexible in the roll direction and easy to apply to single dimension curves. The challenge happens when the glass bends in two directions at once normally along the edges of the window. The solution is straight forward. Start at the center of the window in what is normally the flat part and work the elements outward towards the edges. When the element locations start to diverge from the desired alignment stop and cut each element into individual strips as shown below. These strips can then be applied around almost any curved surface. It is critical that the spacing of the elements be maintained. The number of elements on each bus bar MUST be maintained as per the drawing in the instructions.. The kits buss bars should be placed in the relatively flat area of the glass. Several elements are damaged, can I just apply new Clear View defroster elements? The Clear View defroster elements are much more electrically conductive than the elements on the original defroster from the factory and must be used with the Clear View side buss bars. So it is NOT possible to simply replace a few defroster elements with Clear View elements. Can I plug the Clear View Defrosters into a cigarette lighter or auxiliary power plug? Plugging a Clear View defroster into a auxiliary power plug is not recommended. The answer has to do with which Clear View Defroster is being installed. Most auxiliary power plugs have a low current (amperage) ratting of 7-10 amps. Most defrosters including the Clear View defrosters pull substantially more than the capability of the plug and thus pose a fire hazard. See the Clear View Defroster Guide for more. To order see the Clear View Order Guide. Yes we ship internationally! Please see our order page for more in international shipping. Our friendly staff is standing by to answer your defroster questions.